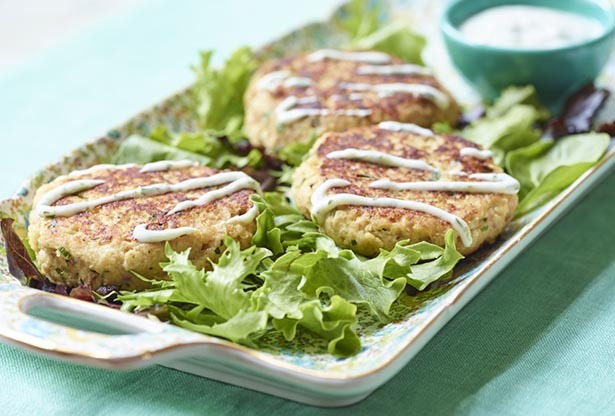 Serve heart-healthy Parmesan-crusted salmon cakes with a tangy homemade dill-yogurt sauce for a light lunch or dinner. In a medium bowl, stir together yogurt, lime zest, lime juice, dill, salt and pepper. Cover and chill. Mix together yogurt, Parmesan, egg, mustard, chives, parsley, shallot, garlic, salt and pepper in a large bowl. Gently mix salmon and breadcrumbs into yogurt mixture. Divide mixture into eight equal portions and shape into 2-inch cakes. Refrigerate, uncovered, for 30 minutes. Place a large, nonstick skillet over medium-high heat. Spray with nonstick cooking spray and slide salmon cakes into skillet. Cook 4 minutes per side or until golden brown and heated through. Serve hot with lime dill yogurt sauce.